Consider adding lighting in your backyard. It will improve the clarity of the outdoor space and enhance its aesthetic appeal. Ordinary bulbs may brighten up the space, but other options offer more. One DIY backyard idea is to use outdoor pendants and votive candles to create the perfect ambience. Choose the types and colors of lights that blend easily with your outdoor space. Some homeowners prefer modest lighting for the patio rather than extreme brightness. Choose your pendants and candles based on utility and beauty. Sometimes you want to sit on the patio and enjoy the outdoors without bugs and direct sunlight. An easy way to change your outdoor space is to add an enclosure. This is one of the most effective ways to improve the appearance of the patio while offering greater privacy. 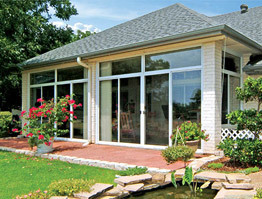 When adding a porch enclosure, you have many options ranging from a screen room to a four-season sunroom. The room type you select for your addition depends on how you will use the room. A screen room allows you to enjoy the natural breeze every time you’re in the room, but in most climates, you can only use this room from late spring to early fall. A four-season sunroom can be enjoyed all year long and is a true extension of your home. Either option will allow you to get greater enjoyment from your outdoor space and keep the insects out while allowing the fresh air and natural light to come in as you enjoy your new room. It is possible to create a visually attractive perimeter around your patio by using potted plants. A group of plants can be arranged in a unique order around the patio to achieve the double advantages of order and beauty in this DIY backyard idea. For maximum effect, the plants can be comprised of a variety of different blooms. If carefully and creatively selected, the perimeter can become an amazing focal point of the patio. In addition, the arrangement can be changed regularly to accommodate other creative ideas and avoid monotony. With all of these beautiful additions to your backyard, you’ll need somewhere to sit and enjoy them. Seating can be added to your backyard in a variety of ways, from a beautiful set of table and chairs to a backyard gazebo. 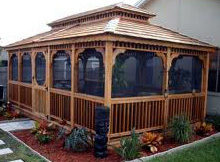 Gazebos can be a great addition to your outdoor space and a rather easy DIY idea. They are attractive and have a variety of design and utility merits. Seating areas can be used for dining, socializing or simply relaxing. For extra appeal, add a beautiful winding path of decorated gravel or marble that leads to your seating area. Every once in a while, it’s a good idea to take a look at your overall landscaping and see what needs improvement or what you might want to add or change. Add some gorgeous greenery and vivid colors with plants and flowers. Go with your perennial favorites or try new things. 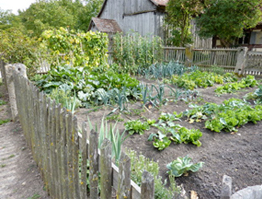 If you’re not sure what types of plants thrive in your environment, consult your local nursery, and they’ll be able to tell you what your geographic region favors. If you’re not sure about what type of landscape design to use, do some research online and look at pictures of well-designed yards. Remove any dead plants or shrubs and replace them with new greenery. You may even want to consider adding a pond or waterfall for a beautiful focal point. Your landscaping potential is limited only by your creativity. Combining the beauty of nature with yard decor is just one way of elevating any outdoor area. There are no set standards for creating a beautiful outdoor space that works for you. Take a look at DIY ideas, narrow your choices down to one and get started. After all, DIY backyard projects can be a great activity for you and your family.